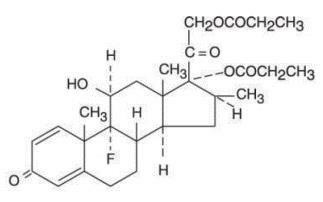 Betamethasone Dipropionate with NDC 70771-1380 is a a human prescription drug product labeled by Cadila Healthcare Limited. 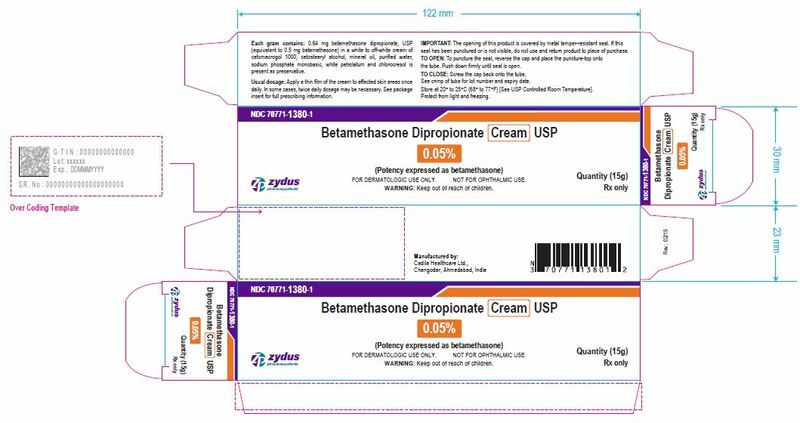 The generic name of Betamethasone Dipropionate is betamethasone dipropionate. The product's dosage form is cream and is administered via topical form. 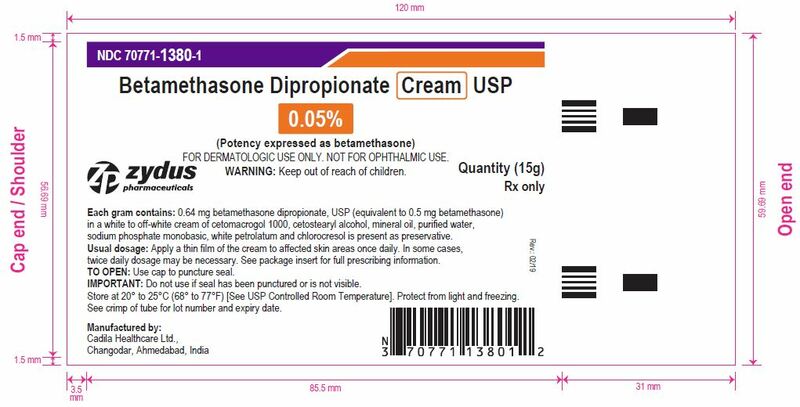 Each gram contains betamethasone dipropionate 0.64 mg equivalent to betamethasone, USP 0.5 mg.Betamethasone Dipropionate Cream USP, 0.05% is white to off white cream, free from lumps and foreign matter with no phase separation is supplied as:NDC 70771-1380-1 in tube of 15 gNDC 70771-1380-4 in tube of 45 gStore at 20° to 25°C (68° to 77°F) [see USP Controlled Room Temperature].Protect from light and freezing.Call your doctor for medical advice about side effects. You may report side effects to FDA at 1-800-FDA-1088.Please address medical inquiries to, MedicalAffairs@zydususa.com or Tel. : 1-877-993-8779.